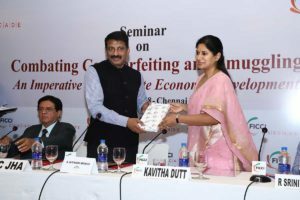 Ms. Kavitha Dutt, Co-Chairman, FICCI Tamil Nadu State Council, while welcoming the dignitaries, highlighted the objectives of the seminar which included generating awareness, interaction with law enforcement agencies and sharing of best practices. She said that the market for smuggled, counterfeits and contraband products was spreading its tentacles across the industry and this crime had increased manifold. She emphasized that it was imperative to reassure legitimate business owners and consumers that the government was serious about protecting their rights. 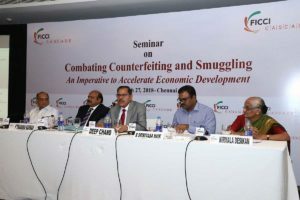 Mr. P C Jha, Advisor, FICCI CASCADE and Former Chairman, CBEC outlined the impact of counterfeiting & smuggling. “During the last twenty years, volume of counterfeiting activity has increased 100 times and the size of trade in counterfeited goods is 10% of the legal international trade (around 2% of the world’s overall economic output). The problem of illicit trade is much more serious than it is commonly perceived. It has a huge adverse impact on the security and economy of the country, revenue of the government, health of the people and on the environment. 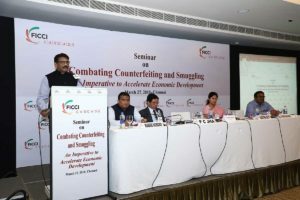 There is also no doubt that the illegal money generated through illicit trade in smuggled, counterfeited and pirated goods is a major source to finance such dangerous activities as terrorism, insurgency and other organized crimes”, said Mr. Jha. Advisor, FICCI CASCADE and former Special Commissioner of Delhi Police, Mr. Deep Chand said that industry should cooperate with the police to ensure conviction and not stop at just filing complaints. “It is time that we, as a nation and as a part of the global economy, call for stern and resolute counterstrike measure against such ill-intentioned activities; starting with greater vigil at the borders to bilateral and multilateral engagements between nations, strengthening the enforcement agencies and working towards the removal of ambiguities in the law related to illicit products”, observes Mr. Chand. On the factors behind consumers opting for counterfeit products, consumer right activist Nirmala Desikan said those who bought fake goods did so as they were cheaper. On drug counterfeiting, she said at one point of time there were about 35 counterfeits of the popular “Nimesulide” (a pain reliever) brand. She said consumers should be alert as such illicit products could be a cause of morbidity and mortality. The seminar also marked the enthusiastic and encouraging support of Mr. P. Thamarai Kannan, Inspector General of Police, Crime (CID) and Mr. Jagannath Ramaswamy, Chief Mentor, Crystal. Mr. Ramaswamy emphasized on the role of organizations like FICCI and appealed to the industry to help protect the “Consumer”. Mr. Ruban Hobday, Head, FICCI Tamil Nadu State Council gave the Vote of Thanks. 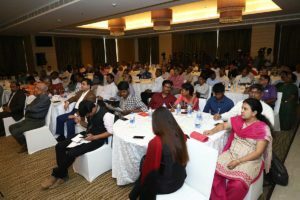 Over 150 people attended the seminar, which saw vigorous interaction with most delegates demonstrating an active interest in the issue.